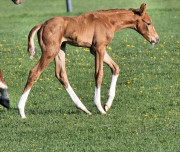 Free To Be’s 1st foal has exceeded my high expectations. Long-legged, correct, with a wonderful shoulder and great angles behind — he is built for dressage. Uphill, forward and balanced, at days old. Flying Colours is by the handsome Florencio / DeNiro son, Fabregas, Reserve SPT winner, stallion sire, and winning dressage competitor, at an early age. 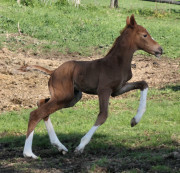 Fabregas is known for his rideability, and transmitter qualities — all the Fabregas foals who attended inspection sites in 2013 were “called-back” for being exemplary. 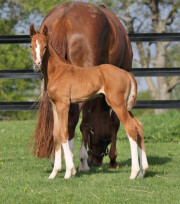 This colt’s dam, Free To Be, is a beautiful daughter of Altpremiumhengst Fidertanz who was a “callback foal” at her own inspection in 2008. Free To Be’s dam, SPS Ditana, has been a wonderful producer at Sunnydays, delivering great type, good legs, and a strong backend to her progeny. 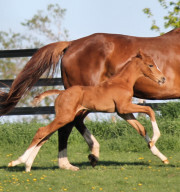 Plus – this flashy foal is a sweetheart. I expect he is a prospect for international level dressage, and my hope is that he goes where his abilities will be properly developed. 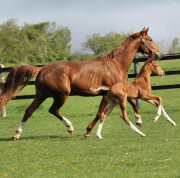 These pictures show the flying machine at 2 to 6 days old; and here is a brief video of Flying Colours, at pasture with his dam, just 5 days old. 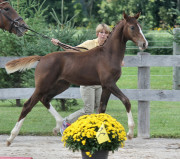 This exciting prospect was SOLD at 2 weeks old, to Lauren in WA, as her future dressage partner. A super match!. Update: At the Parkwood Hanoverian Inspection on Sept 3, 2014 Flying Colours was selected Champion Dressage Foal 2014 from over 22 candidates, praised for his power and lightness, ability to sit, and correct, uphill conformation.